PEORIA, Ill. — The son of former White House cabinet member Ray LaHood emerged as the leading contender Wednesday to replace U.S. Rep. Aaron Schock, as two other potential candidates abandoned thoughts of seeking the seat that is coming open after a spending scandal forced the Illinois congressman’s abrupt resignation. State Sen. Darin LaHood, a Republican whose father held the central Illinois seat before Schock and then served as President Barack Obama’s transportation secretary, announced that he would seek the seat Wednesday morning during an appearance on a radio show in Peoria, where his family has resided for decades. “This is an opportunity that doesn’t come around very often,” LaHood said, saying he had received “a lot of encouragement” to make a bid for the post in the hours that followed Schock’s announcement Tuesday. LaHood, 46, said he plans to campaign on his record as a former state and federal prosecutor, and on his record as a fiscal conservative who advocated for ethics reform. He told the Associated Press he considers himself more conservative than his father, a Republican who served under a Democratic president and organized bipartisan retreats to foster cooperation. Two other GOP state senators — Jason Barickman and Bill Brady — were considering bids, but both said they had decided against running in a special election that Gov. Bruce Rauner will call after Schock leaves office March 31. It must be held within 120 days, meaning voters will select a replacement by the end of July. A number of GOP officials moved quickly to support LaHood’s candidacy in Illinois’ 18th district, which is predominantly Republican, while others wanted the dust to settle before backing a Schock replacement. Former Illinois Republican Party chairman Pat Brady said officials likely will be looking for someone who carries a different image than Schock as the district tries to rebound. A Republican state lawmaker from the area, Rep. Don Moffitt of Gilson, said the district “wouldn’t skip a beat” if LaHood replaced Schock. “We’re just extremely fortunate to have someone of Darin’s caliber in the wings that could take over this seat,” Moffitt said. Local Democrats, meanwhile, said they were still discussing possible candidates. Jackie Petty, vice chairman of the Peoria County Democratic Party, conceded it would be difficult to beat a strong Republican candidate. Schock’s departure, fast and hard even by Washington’s standards, was still resonating Wednesday for the area’s politicians and Schock’s constituents. Already in his fourth term in Congress at age 33, Schock was the rare media-savvy GOP millennial on Capitol Hill, attracting fans on Instagram, posing bare-chested on the cover of Men’s Health magazine, and leveraging his national profile to become a prodigious fundraiser for fellow Republicans. 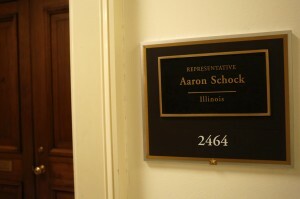 Energetic and ambitious, Schock made it into the lower rungs of House leadership last summer as a senior deputy whip. But an intensifying barrage of media investigations showed that, along the way, Schock accepted rides on donors’ private planes without properly reporting them, made improbably lucrative real estate deals with political supporters, and spent $40,000 in taxpayer money to decorate his office in the style of “Downton Abbey” — money he paid back after the expenditures came under question. On Wednesday, Schock’s father defended him against what he called “malicious” media reports. Earlier, the elder Schock told ABC’s Chicago affiliate his son was sure to be successful going forward, “if he’s not in jail.” He told the AP his son was upset with him for having spoken to the media. Associated Press writers Erica Werner and Stephen Braun in Washington and John O’Connor and Nick Swedberg in Springfield, Illinois, contributed to this report.